Shopping for Marvel vs. Capcom Mini-Figures? The showdown between the heroes of Marvel Universe and Capcom collide at San Diego Comic-Con 2011 with these Minimates! 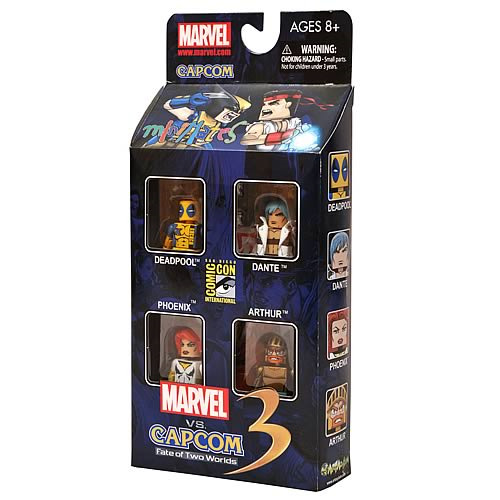 This exclusive four-pack of minimates features the greatest heroes of Marvel vs. Capcom 3! Dante, Phoenix, Arthur and Deadpool are displayed in their Player 2 colors and stand 2 1/2-inches tall. Each figures comes with their own personalized accessories. Sculpted exclusively by Diamond Select Toys, these mini-figures are a must for your collection! Ages 8 and up.